The Holy Mountain is a kinda/sorta companion piece to El Topo, but it has nothing really to do with the earlier film at all. All told: both are epic tales, both have more going on than meets the eye, and both are journeys toward the inner-self organized by Jodorowsky – any connection ends there. The Holy Mountain is symbolically based in religious mythology (Christian, Hermetic Qabalah and Hebrew) astrology and the tarot. Some of this is quite obvious (the Jesus stuff on the front end, the “Seven” living lives as dictated by their champion planet), while other things here will need to be researched and uncovered to fully get explained. And like with El Topo, the best tour guide for the film is Jodorowsky himself, present in the form of another stupendous commentary track. But I’m getting ahead of myself. The film focuses on “The Thief” who wakes up on the streets covered in his own filth. He is subsequently abused by his fellow man, taken advantage of by the Church and manipulated to attempt a robbery on “The Alchemist” who lives high up in a tower – sending bags of gold down on a hook in exchange for food. Once the Thief and the Alchemist meet, the Thief is taken in as a student of the Alchemist and attends the journey of enlightenment. It culminates in the Alchemist joining the Thief up with a group of seven of the richest, most powerful people in the world (and the Alchemist’s female assistant) who are sent on a journey of rebirth in search of the “holy mountain,” where, much like El Topo, they meet a series of Masters who pass vital information on – ending with a coda to the audience that there is more to the journey of live than learning: life must be lived. 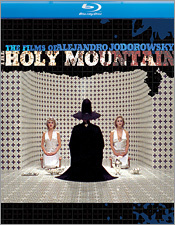 Though I love The Holy Mountain, I’d find it hard to believe anyone could consider themselves a big a fan of this film. It’s a huge film, filled with a lot of symbolism and actual symbols; but to “get” this film you either have to have studied Eastern religion and philosophy for years (decades), or pour over manuscripts, texts and (yeah, sure) websites looking at screen grabs of the film to research the various... things (it really is the best word) going on in the film... which, in the end, would ultimately leave you an expert on Eastern religion and philosophy. The Holy Mountain is a great piece of cinematic art, but it’s a bit heavy handed in places and the acting is a bit stiff here and there (considering most of, if not all, of the cast aside from, Jodorowsky, were amateur actors). It’s something, you’ll learn through the commentary, Jodorowsky intended, as he wanted real people playing their types and not actors acting a type. Go in with an open mind, and expect to be wowed visually and The Holy Mountain will be a pleasant experience. Originally restored for the Jodorowsky DVD box set, the upgrade to Blu-ray really helps this film. The 2.35.1 widescreen encoded for 1080p HD is a remarkably colorful and vibrant transfer. Unlike the Blu-ray for El Topo, this is a noticeable leap-up over the DVD. Digital noise reduction is noticeable here and there, but nothing to squirm in your chair about. Line definition is solid, with solid black levels and no sign of compression artifacts. Sound is available in DTS-HD 5.1 Master Audio and PCM 2.0 Stereo with no hiss or distortion to speak of. The 5.1 track fits the film quite well, but the 2.0 isn’t too shabby either. Both do well to draw you into the film with ambient noise and a well-honed track of Eastern-influenced music. Subtitles in English, Spanish, French and Portuguese are also on board. Extras begin with the above referenced commentary. Like El Topo, you really should watch the film once and then again with the commentary to get the full blown experience. There’s also a short documentary of sorts about the tarot; narrated/explained by Jodorowsky, who is considered an expert in the field. You also get the film’s trailer, a restoration demonstration that’s quite enlightening narrated by Joe Burn from New York’s PostWork who worked on a full recreation of the film’s negative to get the film to look as gorgeous as it does and copy of Jodorowsky’s shooting script that actually fares better on Blu than it did on DVD. And finally, like El Topo, the soundtrack CD for this film that was in the box set is missing so don’t go trading that in because you have Blu-fever. Alejandro Jodorowsky is an artist. His films are art. They stare at you and demand you stare back. It’s taken decades for us here in the states to get these films into our homes, and they look remarkable on Blu-ray. The upgrade isn’t necessary, but with The Holy Mountain especially, if you’re a fans of these films or this remarkable filmmaker – you’ll definitely be glad you picked them up.